Although Hashimoto’s disease is considered a leading cause of hypothyroidism around the world, it is a tragically overlooked disease in mainstream medicine. You might be thinking, “My doctor has never diagnosed me with Hashimoto’s disease. This post is not about me.” Are you sure? You may have Hashimoto’s disease and not even know it. Have you gone to your doctor complaining of common hypothyroidism symptoms, such as fatigue, weight gain, brain fog, muscle weakness, constipation, irregular menstrual cycles, frequent infections, dry skin, and hair loss? Has your thyroid lab test come back “normal” and your doctor tells you your thyroid is perfectly fine, yet you walk out of the office without relief from these common symptoms? Have you had your thyroid antibodies tested? Are you sure? According to the American Association of Clinical Endocrinologists and The American Thyroid Association, iodine deficiency is the most common cause of hypothyroidism on a worldwide basis. In areas of iodine sufficiency, such as the United States, the most common cause of hypothyroidism is Hashimoto’s thyroiditis. Despite the prevalence of Hashimoto’s, thyroid antibodies are often NOT tested. You may have Hashimoto’s and not know it. 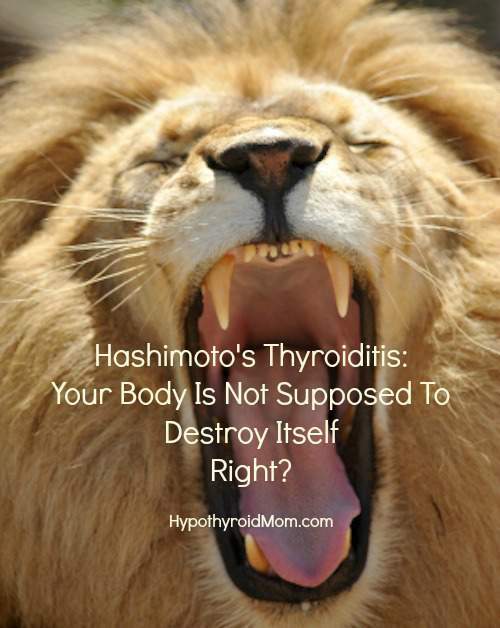 With Hashimoto’s, your body attacks and destroys the thyroid gland piece by piece eventually rendering your thyroid gland incapable of producing the hormones your body needs eventually leaving you with full blown hypothyroidism. This process of destruction can take years even decades, all the while you begin developing more and more hypothyroid symptoms yet your doctor’s thyroid lab tests come back “normal”. Traditional mainstream doctors rely on a thyroid blood test called TSH, thyroid stimulating hormone, to diagnose and treat hypothyroidism. The problem with Hashimoto’s is that your TSH can turn up ‘”normal” while your body is quietly destroying your thyroid gland and your doctor has no clue because the level of destruction hasn’t YET triggered an abnormal TSH reading. The number one issue is that many traditional doctors do NOT test for thyroid antibodies. In mainstream medicine TSH rules, leaving millions of Hashimoto’s patients around the world undiagnosed and untreated. You must be an advocate for yourself and insist on the following two thyroid antibody tests. If your doctor refuses to test your thyroid antibodies, you have the option to order your own thyroid lab tests. True Health Labs is a trusted place where you can order comprehensive thyroid testing including thyroid antibodies and more. The advantage of True Health Labs is that they offer one-on-one results review with one of their Functional Medicine doctors so that you understand your lab test results and next steps. If you have a Flex Spending Account (FSA) with your employer, all lab tests ordered online at True Health Labs are FSA-friendly! Use coupon code Limited_5 for 5% off all orders for Hypothyroid Mom fans. True Health Labs offers discounts throughout the year so be sure to check the very top of their website to see if there are any promotions going on at the time of your purchase. *If you are located outside the areas listed for a particular test you wish to order, contact True Health Labs on their website directly for assistance. Some people with Hashimoto’s test negative because their overall immune health is weak and they do not produce enough antibodies. Their immune systems have been so stressed for so long that their total white blood cells and B-cells are too low to be able to make antibodies. Doctors refuse to treat Hashimoto’s when TSH is normal. Another major problem is that many traditional doctors refuse to treat patients who test positive for thyroid antibodies, even when they suffer debilitating symptoms, all because their TSH level is “normal”. Unfortunately TSH rules above all else in mainstream medicine when it comes to hypothyroidism. You may have Hashimoto’s disease with elevated thyroid antibodies, yet all because the destruction of your thyroid gland has not YET destroyed enough of your gland yet to trigger an abnormal TSH reading, you are refused treatment and forced to cope with your symptoms. It is also possible that the thyroid hormone levels circulating in your blood show up “normal” on your blood tests, however the problem is they are not getting into the cells of the body to take their effect. Your blood tests turn up normal yet you have symptoms of hypothyroidism. There are a multitude of people with Hashimoto’s disease who suffer low thyroid symptoms even though their lab tests are normal. Doctor’s trained in the mainstream protocol that “only patient’s with TSH higher than X should be treated” leave their patients with thyroid antibodies but normal TSH level untreated. They use this medical protocol to justify why their hands are tied. There are countless Hashimoto’s sufferers around the world feeling helpless right now because their doctors refuse to help them. TSH alone does not give a full picture of thyroid health. Thyroid lab testing at minimum should include these 6 tests as described by Yale-trained physician Dr. Aviva Romm in her guest article for Hypothyroid Mom Hypothyroid Testing: TSH, Free T4, Free T3, Reverse T3, Thyroid Peroxidase Antibodies, and Thyroglobulin Antibodies. You are taking thyroid replacement medication, but you still have symptoms of hypothyroidism. Are you on thyroid replacement medication and your doctor insists your thyroid lab results are in the normal range, but you still don’t feel well? Your doctor increases your dosage, you feel better for a short while then the symptoms come back again. Why do you feel sick even though your thyroid lab tests are normal? Or perhaps you are like many Hashimoto’s sufferers with TSH levels fluctuating high and low like a wild roller coaster ride with symptoms of both hypothyroidism and hyperthyroidism. Your doctor happens to catch your TSH level during a low point and decides to reduce your thyroid medication as a result, even though you suffer terrible symptoms. Why can’t your doctor figure out why you are sick and tired? First of all, many doctors fail to test for thyroid antibodies and they have no idea you have Hashimoto’s disease. However, even the ones that test for thyroid antibodies may not know how to help you. They rely strictly on your TSH levels and base thyroid replacement medication dosages strictly on these results and while your thyroid antibodies are high, their attention is focused on your TSH level. The thing is Hashimoto’s is more than a thyroid condition. It’s an autoimmune disease. What about addressing the underlying autoimmune issue? This is where conventional medicine fails to help patients. Often times mainstream doctors don’t test for thyroid antibodies because it won’t change how they treat you with Hashimoto’s – treatment with thyroid hormone replacement medication…period. Now we know there is much that can be done to address the autoimmune issue in Hashimoto’s, but it takes a great thyroid doctor to think outside the box and investigate each patient’s case fully. A person inherits particular genes that predisposes their immune system to misreact. During the course of a person’s life there are many possible triggers that can then turn those genes “ON” like the flip of a light switch. Once these genes are turned on, the body begins producing antibodies against their own body part, in the case of Hashimoto’s against the thyroid. If the triggers are left untreated, the attack continues. It is crucial to determine if one or more of these triggers are responsible for your condition. Here are possible triggers to investigate. Although Hashimoto’s disease is a leading cause of hypothyroidism around the world, it is a tragically overlooked disease in mainstream medicine. Hashimoto’s sufferers often find little help from their doctors living decades with debilitating symptoms. If nothing is done to slow down the attack on your thyroid, you become vulnerable to develop other potentially life-threatening autoimmune diseases. Your whole body becomes fair game for attack, all while your doctor insists you are fine. ATA/AACE. Clinical Practice Guidelines for Hypothyroidism in Adults: Cosponsored by The American Association of Clinical Endocrinologists and The American Thyroid Association. Endocr Pract. 2012;18(No.6):989-1028. I’m very sorry to read about the loss of your baby Kerrie. Please know that thyroid dysfunction including Hashimoto’s can impact fertility and pregnancy and result in miscarriage. There is hope to have babies with optimal thyroid treatment. Here is my story. I was diagnosed with hypothyroidism as a teenager only to find out in my 20’s that it was caused by Hashimoto’s thyroidits and I went euthyroid and taken off medication. I always had to deal with fatigue and muscle weakness but my levels every year kept coming back normal. I was so tired with constant fatigue that I decided to change my primary care physician so I can have someone look at it with a new pair of eyes. Since I told her I had Hashimoto’s she ordered a thyroid sonogram and I had a multinodular thyroid and a big mass that looked suspicious. A biopsy determined that I had a follicular lesion and further biopsy could not rule out the possibility of thyroid cancer so they sent for genetic testing. I always say listen your body. Do thyroid disorders increase miscarriage early on or all throughout the pregnancy. I believe my daughter may have an undiagnosed thyroid condition and she 27 years old and is 33 weeks pregnant. As her mom I just found out I may have hashimottis with no symptoms. She’s had symptoms since 7th grade. Never diagnosed. Is she at risk for stillbirth with undiagnosed thyroid issues? Hey all my thyroid peroxidase level is 5737 is this something that is crazy high or is this common … I have Lyme disease to top it all off!! Had a recent seizure and mycologic seizures then after…. anyone experience this?? I have been diagnosed with…Multi nodules non toxic goiter, TPO test 900…Hashimoto disease. Needle biopsy was done..no cancer. TSH low,T3 abd T4 not normal…Taking 100mg of L-thyrozine per day. All of this gives me hypothyroidism. My question to you is…Is medication enough to stop Hashimoto? I’ve read so much about diet. Another thought..I just had a blood test and my calcium level was 10.4..should I be concerned? It’s my first time visiting this page. I am amazed at all the info I’m getting. Thanks so much. Here in South Africa not a lot is known about Thyroid problems the doctors here prescribes medication and that’s it. My Test Results shows my Ferritin – 12, Free T4 – 8.1, S-TSH – 8.51 Thyroglobulin AB – 2.5 and Thyroid Peroxidose AB – 632.9. All that was said to me is that it is Hashimoto’s Thyroiditis and I was given medication. I’m constantly trying to equip myself with knowledge of this and reads about anything. But I’m getting confused as to what do you have to do or what tests is still needed. Sorry I’m all over. But what is the best way to go about this, because it doesn’t feel like the medication is doing much. I still feel tired and still struggles to sleep. I recently started having urinal tract infection and Candida, also discovered a cyst at the back of my womb and I have constant spotting. I asked several doctors if this has anything to do with Hashimoto’s and all of them replied no. I guess what I want to say is it’s nice to hear I’m not alone. Thanks for you articles and info. My TSH level is 7.05 and its gettin worse. I too lost a baby at 16 weeks gestation. I am so sorry for your loss. I am now beginning to wondering if my elevated thyroid peroxidase was the culprit. My TSH level is on the high end of normal at 4.25. My thyroid peroxidase was 291. My father also had been diagnosed with Hashimoto’s in the past. I’m not exactly sure what I should do now. Any input would be greatly appreciated. Did you ever find out anything, Kathleen?